Grateful Pass Stables is a stable just west of Skingrad. 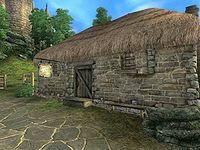 It is one of two places in Cyrodiil where you can buy a bay horse (the other being the Bay Roan Stables in Bravil). They cost 1000 gold each, and while slightly faster than paint horses, they are weaker and more prone to injury. The stables are open every day between 8am and 8pm, even though you can buy a horse at all hours, if you're willing to pick the lock. Esta página foi modificada pela última vez à(s) 15h37min de 21 de fevereiro de 2013.